1. You can approach the patient, address his/her concerns, and kindly ask them to remove the review. 2. You can respond online. Google has a feature that allows business owners to respond to negative reviews, so you can directly address the reviewer’s issues in a calm and reasonable manner online. If the negative review makes claims you can argue against, do so objectively, using facts or other customers’ experiences as talking points. (Note: While replying to online reviews, you should not confirm that reviewer is your patient or respond with detail about their specific information because doing so may be a HIPAA violation). 3. 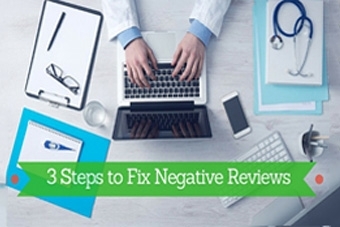 You can offset negative reviews with good reviews. Here are some suggestions to get more positive reviews on Google+ page. Encourage happy patients to write reviews on Google. More number of positive reviews will help in pushing down the negative review and decrease visibility of negative post. Send out an email blast, with a link to your Google listing, asking satisfied patients to post reviews. Your email should be brief and direct. Here is an example. Hi there! At (practice name), we take pride in offering exceptional service to our patients. One of the best kinds of compliments we can receive is a review from you! Google Places is where most people search for local services online, and we’d love it if you can go on there and write a little something about us. It’s a very simple process and will help us out tremendously in getting the word out there! We really appreciate your support and thank you for being a part of our family. However you choose to address a negative review, you should always be trying to get those positive reviews from your happy patients. Read our eBook for more information on getting positive reviews for your practice.